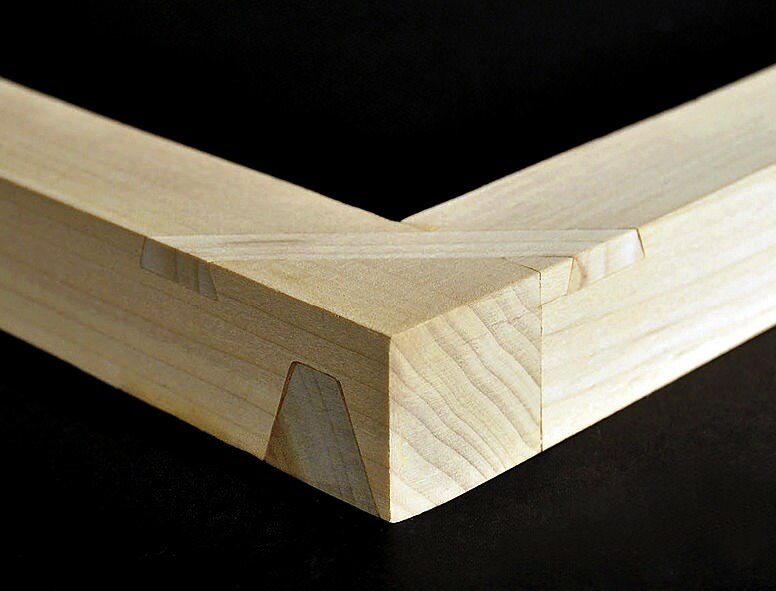 A wood joint that Liesl Ulrich-Verderber ’15 and Mathew Murray ’16 designed during the first weeks of the construction lab. 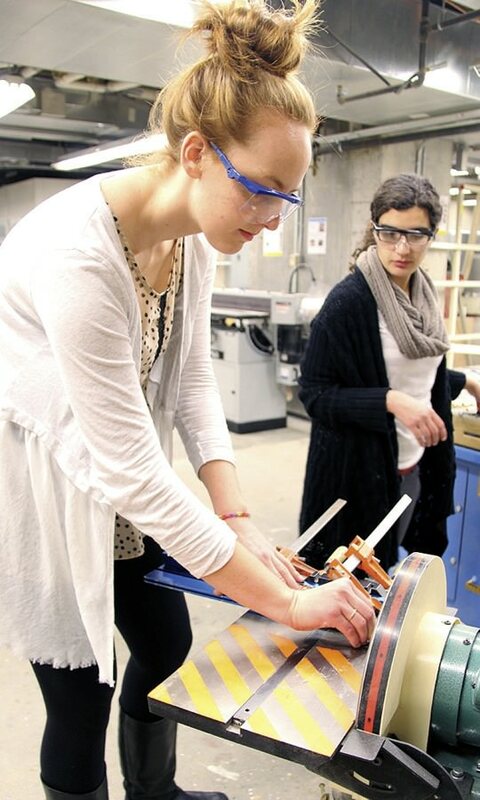 Katherine Ingersoll ’15 and Samia Kayyali ’15 work on the construction lab’s final project in the GSD’s wood shop. John Wang ’16 and Angie Jo ’16, at left, present a component of the cast arch they built in the construction lab to teaching assistant Alex Timmer and course head Mark Mulligan, far right. These three streams—history and theory, design imagination, and the physical act of making—are the central components of the undergraduate track in architecture studies, a joint program from the Graduate School of Design (GSD) and the Faculty of Arts and Sciences’ (FAS) department of history of art and architecture. It took years of planning on both sides—including “literally two years of meetings”—to get the program off the ground in the fall of 2012, explains Noyes professor of architectural theory K. Michael Hays, the GSD’s associate dean for academic affairs. The first students in the track, housed within the art-history concentration, graduated last spring. The second required studio, “Connections,” introduces students to more real-world concepts of scale and interactions. Hong will teach the studio this spring; she plans to move students along through different levels of intervention: beginning with the artifact, moving on to the assembly and construction of an actual space, and finishing with a consideration of the urban and even global scale. 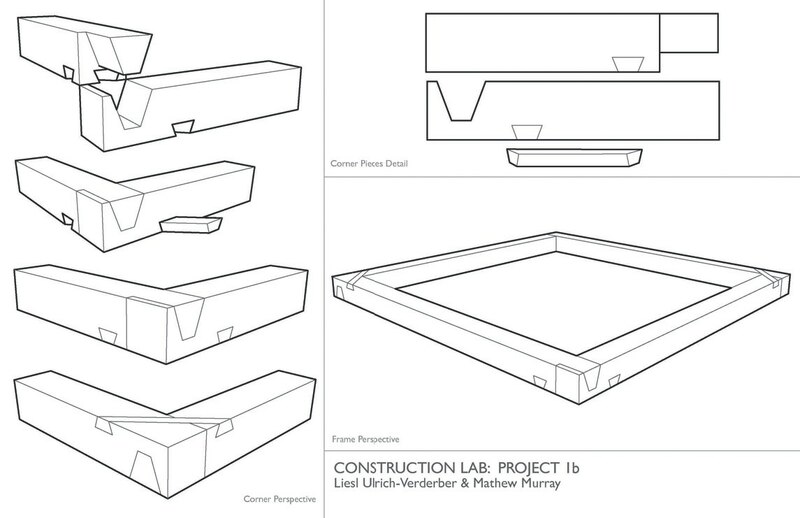 Though Connections will present students with the kinds of problems central to more traditional architecture studios, Hong says that both courses in the sequence are hard to compare to the core, graduate-level studio courses offered at the GSD—which meet for 12 hours each week, twice the time commitment of Connections—or in undergraduate professional programs approved by the National Architectural Accrediting Board. 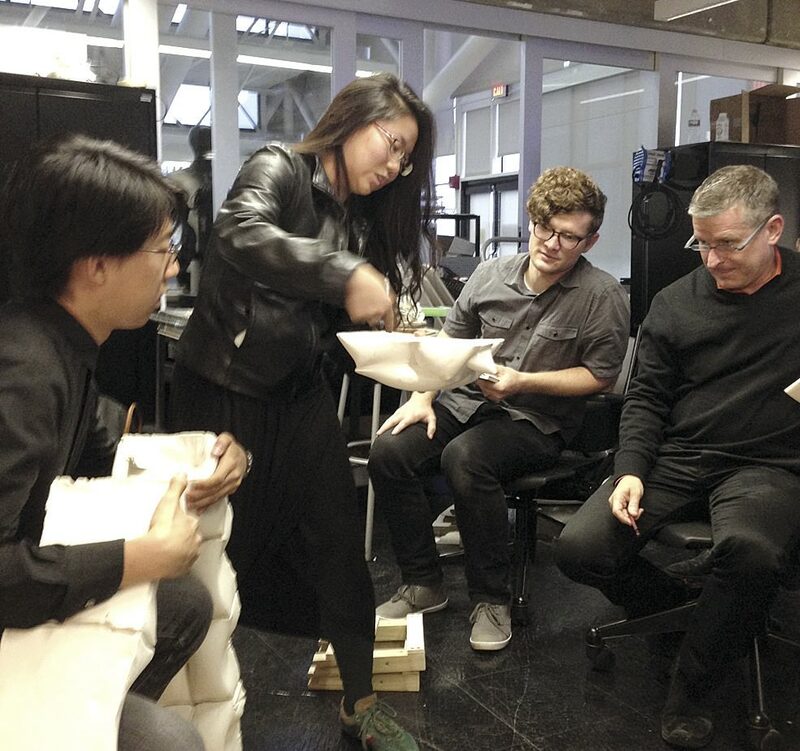 The latter tend to be intensive, five-year plans of study: Cornell’s B.Arch. program includes 10 semesters of studio. Harvard’s new track requires far fewer studio courses, even, than similar nonprofessional undergraduate programs (whose graduates, like Harvard’s, must later earn master’s degrees in order to practice as an architect). At the University of Virginia, where Hong used to teach, the “preprofessional” concentration within the four-year B.S. in architecture degree requires four “foundational studios” and an additional three “research studios.” (Hays says he hopes to eventually offer a third studio, but it would remain an optional, senior-year “capstone” for interested students.) But the track’s pair of studios are two elements in a general education that could hardly be considered intensively preprofessional. Rather, Hong says, they’re meant to establish students’ baseline interests in architecture, landscape architecture, or urban planning. Students’ interests have already created an appetite for more intensive design learning, creating both opportunities and tensions as the track keeps one foot firmly planted in the College’s liberal-arts tradition. Beyond studios, students fill in their track requirements with other courses in both art history and the GSD. During the past two years, several new offerings have been created to accommodate them, including an architectural history and theory tutorial in FAS, and an undergraduate-only section within a standard GSD course (“Buildings, Texts, and Contexts I,” taught by Hays and professor of architectural history Erika Naginski). Students say their dual identities as art historians and potential budding architects have offered a unique and unexpected opportunity. Several have taken part in their department’s annual sophomore-excursion course, which included a trip to Amsterdam last spring. Thomas professor of the history of art and architecture Joseph Koerner, the director of undergraduate studies within the department, says that having students with studio architecture experience has deepened conversations in more traditional classes. “The study of art is very much enhanced by seeing people around you participating in the kinds of constructive thinking and making that [exist] in the works” a course might tackle, he explains. Outside class, some have even found a home in a new building on campus that marries their interests in the study of art and the practice of architecture—the Harvard Art Museums, designed by Pritzker Prize-winner Renzo Piano. Four of the 18 student tour guides whom the museum hired this fall are affiliated with the architecture track; they say they like the challenge of learning to talk about the building’s architecture to an audience that may not have thought seriously about design before. Angie Jo, who had considered art school before coming to Harvard, says she decided to become a student guide because learning to speak authoritatively about design, and make the case for its importance to a general audience, will be an important part of her future as an architect. The study of architecture, from Hays’s perspective, has relevance to the wider student body in much the same way that the study of literature does. Perhaps the best case for his argument is the number of nonconcentrators who have enrolled in the architecture track’s design courses. Enrollment was limited to concentrators when Transformations and the Construction Lab were first offered, but enrollment has essentially doubled since that restriction disappeared. This semester, Mulligan and Smith have students from East Asian studies, film, and applied math in their course. Gianina Yumul ’16, a member of the architecture-studies track who came to Harvard intending to study astrophysics, says she appreciates the course’s almost accidentally interdisciplinary nature. She speaks enthusiastically about working in groups with a student from applied math: “He has this other language that, when applied to architecture, produces something really beautiful and unexpected.” His professors say they hope influence can also flow in reverse: that the spatial awareness of architecture will give this student new tools with which he can better understand math.